Submarine cable supplier and operator Aqua Comms has joined forces with TESubCom, a company specializing in fiber optic cable deployments and marine services, to prepare the groundwork for a transatlantic cable network connecting New Jersey in the US with Ireland and Denmark. The America Europe Connect-2 (AEC-2) cable system will complete a ring-based network connecting the US, Ireland, the UK and Denmark, called Havfrue. With the system due to come online in the fourth quarter of next year, TESubCom has already launched the cable route survey operations. Havfrue (Norwegian for Mermaid) is the brand name for the wider cable system, of which Aqua Comms will own and operate a large proportion. It is the first subsea cable system to connect Northern Europe and the US in almost twenty years. The project was commissioned by a consortium of companies that includes Bulk Infrastructure, Facebook and Google. The extension of Havfrue, AEC-2, will connect New York to Dublin with diverse backhauls to London. The cable will be optimized for coherent transmission and will offer capacity of 108Tbps, with potential for future upgrades. Furthermore, AEC-2 will extend the CeltixConnect-2 connecting Dublin (Ireland) to Manchester and the North Sea Connect cable linking Stellium-operated data center in Newcastle, England to Esbjerg in Denmark, creating a circular network connecting each of the above mentioned locations to one another. Network services will be provided by interconnection points at NJFX in New Jersey and 1025 Connect in New York, and at landing stations and PoPs in Dublin, London, Amsterdam and Esbjerg. 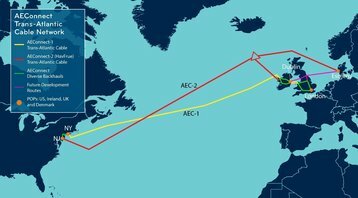 “The demand for hyperscale capacity and connectivity linking North America with Northern Europe cannot be overestimated, and the combination of AEC-1 / AEC-2 subsea cable systems, facilitated by the construction of HAVFRUE will deliver reliability and resilience at an auspicious time, especially in view of the meteoric rise of the digital economy taking place in Scandinavia,” he added.